Romanian-born Ioana Gandrabur is one of the most inspiring artists we know, and we’re thrilled to present her Austin debut on January 27th at the AISD Performing Arts Center. Ioana, who is blind, will spend the week before her concert at Texas School for the Blind & Visually Impaired, working with students in their guitar program. Then, those same students will perform to open her concert! We asked Ioana to tell us about how she discovered the guitar, the impact it has had on her life, and her career as a professional musician. Can you describe your journey with guitar, how you started, and what it’s meant to you over the years? Since I was a little kid I was always attracted to sounds, and would play the songs I knew on any toy instrument I could find. I started piano lessons at five, and it was my piano teacher who suggested I try out the guitar. Her reason was that the guitar is an intimate instrument you can feel with your whole body as you play. I fell in love with it right away. 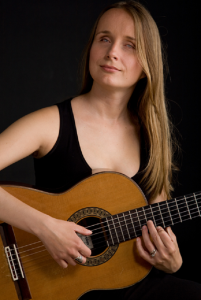 Becoming a classical guitarist helped me find my voice, find a place where I felt strong, and provided a way for me to connect with other like-minded people. My identity became inextricably linked to the guitar and I am grateful for the ability to touch others through music. What has been your experience with braille music and its availability to musicians? In general, braille-adapted texts are much harder to find than printed ones. This situation is improving steadily for books, but braille music is lagging far behind. Great progress has been made with some braille music translation software, but it’s quite expensive. Some libraries have braille music, but if you find a piece you want to learn, you have to copy it by hand. I learned music by having others – usually my father – read the score out loud, note-by-note, as I would write it down in braille. As a musician who is blind, have there been particular challenges to overcome? Did your blindness help foster any strengths? I often joke that being a musician who is blind forces me to do what would be beneficial for any other musician. Not being able to see my instrument encouraged me to develop an innate tactile connection with the guitar, and since I can’t look at my hands, I truly listen to what I am playing. I know many musicians who practice in the dark to hone these skills. Not being able to sight-read makes discovering new repertoire difficult. I would love to sit and read through new pieces, but I have to listen to recordings and thus am dependent on the rendition I hear. The upside is that I have a very well-trained memory, since everything I play has to be learned by heart from the beginning. In terms of teaching students who are blind, I believe it’s critical to hold them to the same standards as you would anyone else. I remember feeling frustrated when I would hear comments like, “she’s a good player, even though she’s blind.” I have always wanted to be known only as a great musician, nothing else. Special thanks to our friends at Texas School for the Blind & Visually Impaired for helping support Ioana Gandrabur’s concert and teaching residency!